Formulated to be used on oily hair, Ayurglow’s Lemon Shampoo works as a powerful and natural scalp and hair cleanser. It cleanses and tones up hair to make it stronger and healthy, so that your hair gets a natural shine from the inner strength naturally. Wet hair, massage a small amount on hair. A complete hair and scalp tonic, this complex treats & prevents dandruff, while nourishing the hair. Lemon tightens the hair follicles, strengthening the roots and preventing hair- fall; while Tea Tree extract moisturizes dry hair , making it shinier and softer. Key ingredients : lemon oil (5 folds) in shampoo detergent base. 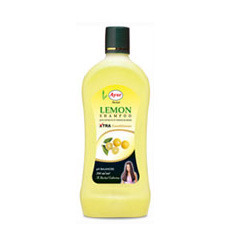 Concept : lemon fruit helps removal of oil & dandruff from hair, maintains natural acid mantle balance & helps tightening of skin thereby supporting non-falling of hair. It also has an antiseptic effect. - Fast effective as it deep cleanses scalp and hair, leaving it supple lustrous and healthy looking. - Directions to Use - Massage into wet hair scalp for 2 to 3 minute and rinse out thoroughly. - Caution: For external use only. Avoid contact with eyes, if this happens, flush eyes with abundant clean water. Packaging Size: 200ml, also available in 400ml, 800ml. 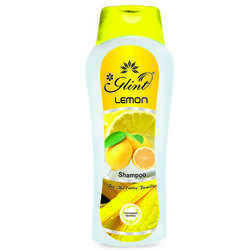 We are engaged in supplying the finest quality Henna Lemon Shampoo to our clients. Our products are affordably design to suit your style with commercial quality. Our products are untouched by human hand in order to prevent contamination. We use specialized high tech machines for packaging of the products in air tight packages. We are well-known firm of 100ml Lemon Cress Shampoo. Prevent Premature Graying And Falling Of Hair. Promotes Growth Of Thick Hair And Maintainsblack. External Use Only.